Yesterday we drove a short three hours to Bulawayo, Zimbabwe's second largest city. We had much of the afternoon free before we cleaned up and went out to a local bar. 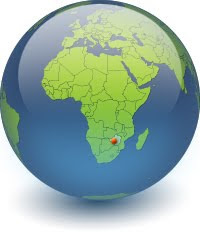 The bar was run by South Africans, and all transactions occurred in Rand, even though Zimbabwe's official currency is the U.S. dollar. We chatted with some white Zimbabweans, who said that we were the first tourists they had seen in a long time. There were no black Zimbabweans in the bar, as society is still quite segregated in this bruised country, and racial relations are tense. It was Jess's birthday, and we all had a hilarious time getting her drunk – and finding a guy in the bar to kiss her. I left in the early hours of the morning and walked back to camp with one other guy from our group, passing monotonous rows of dark, forbidding walls and gates that protect the houses in this well-to-do neighborhood. The fortress-like character does not necessarily mean that it is a high-crime area. High walls and barbed wire are commonplace in posh suburbs throughout Africa. This morning, a small group of us set off early to Matobo National Park, about 45 minutes away. Andy, a stocky white Zimbabwean with a dark beard and mustache, was decked out in khaki safari gear and carried a powerful rifle (in case something goes wrong). 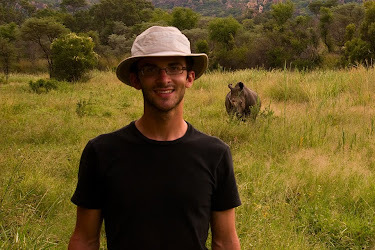 As a tracker, he was going to lead us on a trek – on foot – through the bush to find rhinos. As we entered the park, a sign warned us to stay in our vehicle at all times. African parks are dangerous places, but we had an experienced guide armed with a gun. At our first stop, we hopped out of the jeep and were overwhelmed by the billions of ants crawling over every square inch of dirt. When you walk, they remain on the ground. Stop for even a moment, and they immediately start to climb your shoes onto your legs. Luckily, these ants do not bite, but if you don't pay attention, it would be very easy to get ants in your pants! Andy led us off the road and into the bush. He soon spotted footprints in the sandy earth – they were left by a hippo, quite a long way from water. We continued walking and came across a huge pile of dung. It was rhino dung, and Andy stuck his finger in the pile to determine how fresh it was. He deduced from the shape of the bits of stick in the dung that we were tracking white rhinos – the angle of their teeth is different than that of black rhinos, and this difference is imprinted on their chewed waste. It was good news that we were dealing with white rhinos. Although much smaller, black rhinos are more aggressive and can not be safely approached on foot. This is not to say that white rhinos are docile. They are still massive horned beasts capable of charging with thunderous power. White and black rhinos are actually the same color, but they differ in the shape of their snouts. The "white" in "white rhino" is actually a corruption of the Dutch word for wide, referring to the shape of the snout. White rhinos used to be more rare than black, but conservation efforts have helped them to overtake black rhinos in number. However, both types of rhinos are still very much endangered. Soon, another clue: a patch of flattened grass indicated that rhinos had been laying down in that spot. Soon, Andy led us out of the relatively sparse forest, and we began wading through an expansive sea of grass eight feet high. The grass was so tall and dense that we could have been ten feet from rhinos and not known it. We continued walking for a few kilometers and finally made our way back to the truck. Our first trek was unsuccessful, but we had found some valuable clues. We continued along the dirt road, keeping our eyes peeled for rhino tracks. We didn't see any fresh ones, and the road was a giant loop. This meant that the rhinos were somewhere in the island of wilderness we had just encircled. We soon embarked on another long hike, but this one was unsuccessful as well. We took a break for lunch by a picturesque lake punctuated by prehistoric stacked rock forms that are the distinguishing feature of the Matobo area. Refreshed, we resumed our search in the afternoon. Walking single file in absolute silence, we tread carefully over muddy streams and dodged acacia thorns and stinging nettles. A startled bird flew from a tree branch, the beating of its wings thunderous amidst the total stillness of the forest. We entered a field of tall grass, and after a while Andy turned around and gave us a hand signal. We had found white rhinos! There were three of them in a clearing maybe fifty feet away, more than close enough when rhinos are concerned. In a whisper, Andy warned us that if they charged, we should go through the grass into the nearby river. We silently crept closer, and the rhinos backed off into the forest. We gently walked around and approached them from another angle so we could get a bit closer. We were persistent in following them, and the gigantic creatures soon became annoyed. They started to approach, and Andy told us to back off slowly. Running could provoke the rhinos to charge. The beasts continued to approach a bit faster, not quite charging, but certainly inciting us to back off ever more quickly. The rhinos continued past us and off into the forest. Our incredible encounter was over, and we hiked back to the jeep. 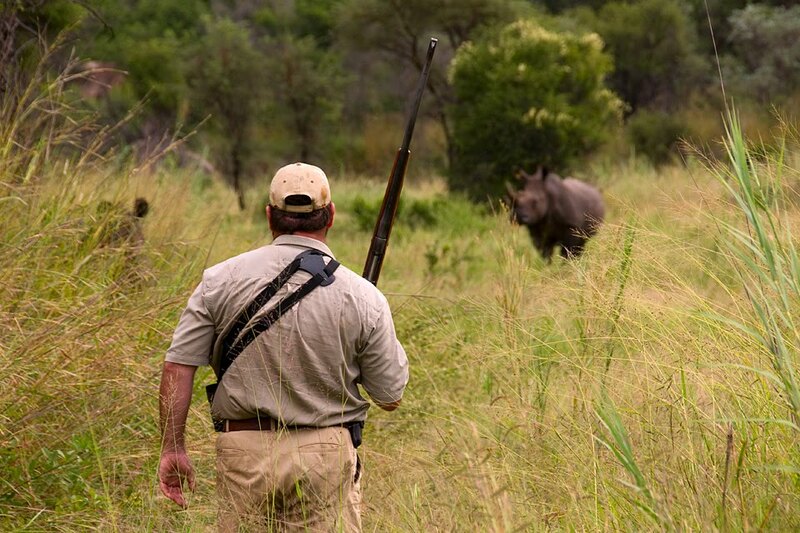 A tracker, armed with a rifle for safety, finds white rhinos in Matobo National Park, Zimbabwe. We still had enough daylight left to visit one of the area's famous cave paintings. We rode in the jeep for quite a while on appalling roads, the worst I've seen so far in Africa. As we traveled further up into the hilly terrain, Andy explained that the park could not repair the roads until after the rainy season. The road had been washed away into deep ruts that ran like chasms through the mud, and it even ended completely at one point so that we were driving directly on the exposed granite surface of the mountain. After one particularly jolting impact on a large rock, one of the rear wheels began squeaking. We soon reached an unusually steep section of the road. We had been going very slowly, but Andy warned us that he had to drive up the hill fast in order for the vehicle to make it to the top of the incline. He accelerated, and we jostled our way up the mountain until the terrain leveled out. After a short but steep hike, We finally reached Nswatugi Cave, where we gazed at the mysterious paintings on the rock wall of the natural shelter. According to experts, they could be anywhere from one hundred to five or six thousand years old. The paintings mostly depict animals such as zebra or giraffe, but there are also horses. This fact indicates that the paintings may be younger rather than older. Horses only arrived when this part of Africa was colonized as Rhodesia. If the rock paintings are from the nineteenth century, it is interesting that the technique has not changed for thousands of years. Based on appearance alone, it is impossible to tell these paintings from ones that are known to be much, much older. As dusk fell, we descended the rocky hill and rode over an hour back to camp in Bulawayo.